Echo Lake Park, at 10,600 ft (3230 m), represents the subalpine ecosystem, with surrounding forests of Englemann Spruce, Subalpine Fir, and Limber Pine. The 24-acre lake is popular for fishing and reflects wonderful views of Mt. Evans. The fen (wetland) at the east end of the lake provides important wildlife habitat; visitors are requested to stay on nearby trails. 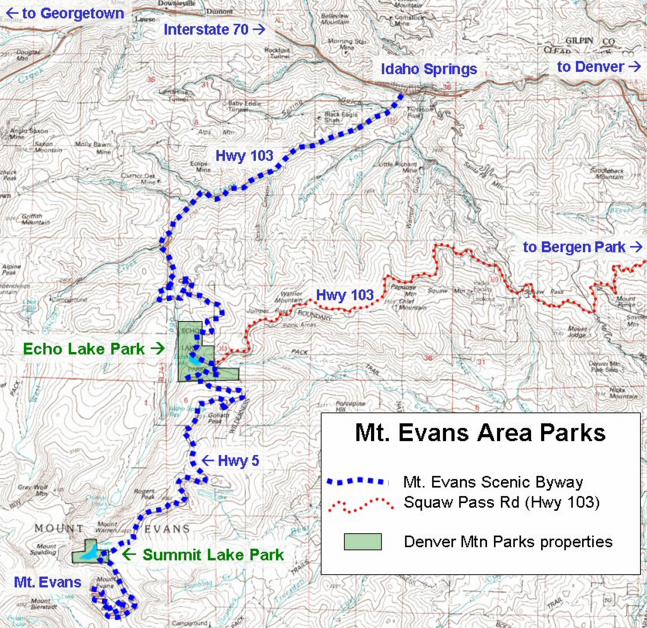 Trails from Echo Lake Park connect to the Chicago Lakes and Bear Track Lakes trails, accessing the Mount Evans Wilderness Area and the summit of Mt. Evans. Take I-70 to Idaho Springs; Exit 240 (Hwy 103) 14 miles to Echo Lake, on the Mount Evans Scenic Byway. 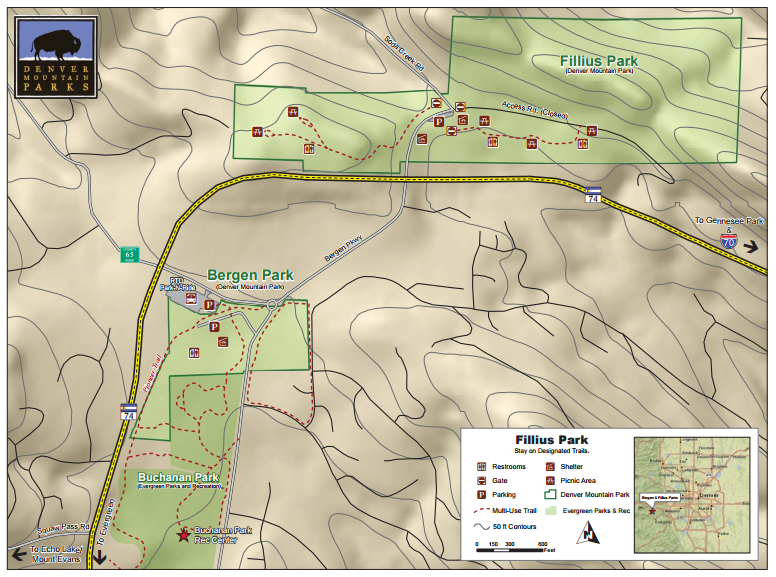 Alternatively, from Echo Lake, Highway 103 (Squaw Pass Road) returns to Bergen Park, creating a loop drive that connects to the Lariat Loop Scenic & Historic Byway. Facilities in the park include charcoal grills, picnic areas, trail around lake. The Ranch, complete with historic runway built by former airline pilot Captain John Schoonhoven, lends this park a fitting name. Healthy meadows, forests, wetlands and stream provide habitat for songbirds, raptors and wintering elk among many species that call this park home. 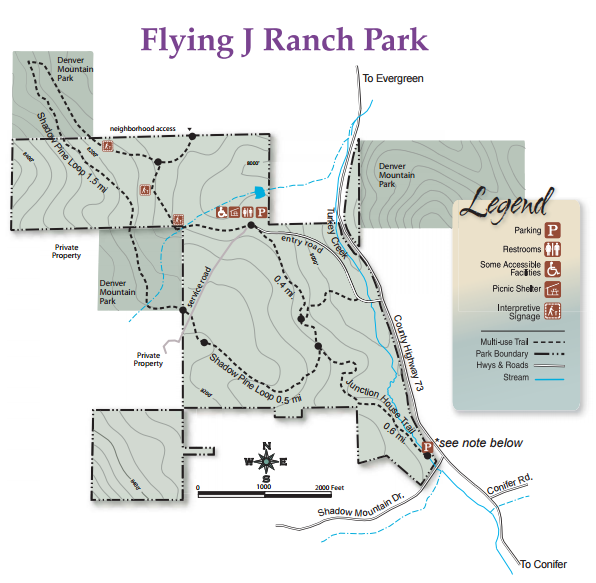 Situated close to Flying J Ranch Park was the migration route known as the Ute Trail, which was used by Native Americans for centuries. At 2,413 acres, Genesee Park is the largest Mountain Park, offering the greatest diversity of experiences in the system. At Chief Hosa Lodge, visitors can experience a major life event such as a wedding or bar mitzvah. Travelers can stop and see the bison herd along I-70, or venture to the top of Genesee Mountain where the panoramic view connecting mountain and plains is spectacular. Its topography reaches to 8,284 feet at the summit of Genesee Mountain, extends to 7,988 feet at a prominent point on the Park’s north side, and meets Clear Creek Canyon at the Park’s lowest point at 6,280 feet. just the right intervals as the crow flies. enjoy the views, the trails, the pure sight distance all the way to the Continental Divide! to our local neighbors and friends. So go for a hike! Nature is a healing force and invigorating and ever awe inspiring. guides, etc. and surprises yet to be revealed hope to reflect and magnify the magic of quality of life we enjoy. 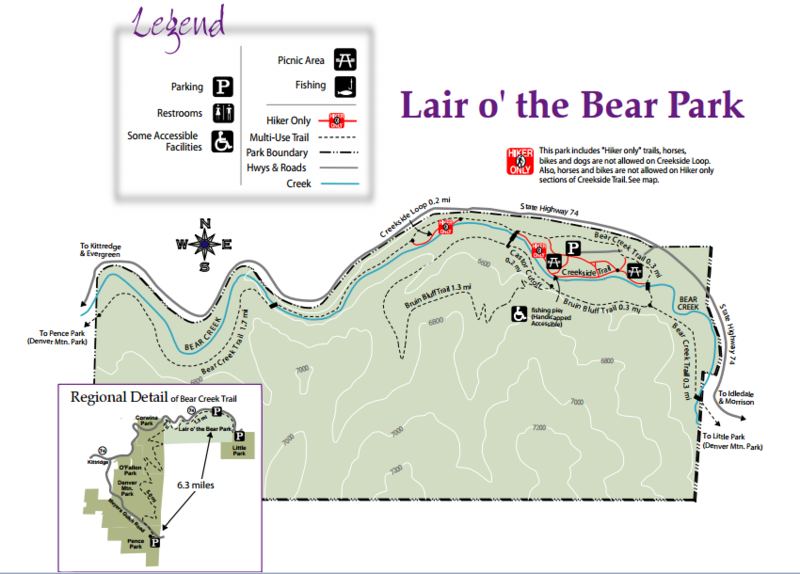 Lair o’ the Bear Park is a favorite of Open Space visitors and families. This small wonder of a park overflows with riches: Bear Creek and its calming current; a riparian ecosystem that teems with life—busy beavers, aquatic insects and the American Dippers External Link Icon that snap them up; and lush patches of wildflowers that flourish along the shores among cottonwood and box elders. There are flat creekside trails for walkers and trout-minded anglers. The Bruin Bluff Trail provides a higher vantage. 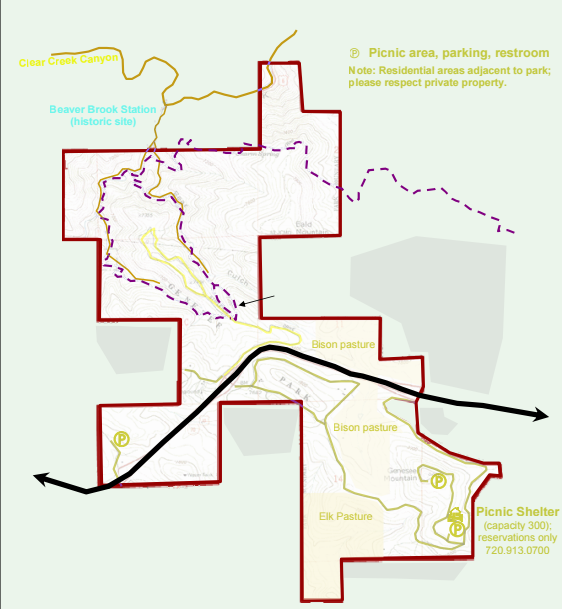 A 1.3-mile stretch of Bear Creek Trail follows the creek within park boundaries. 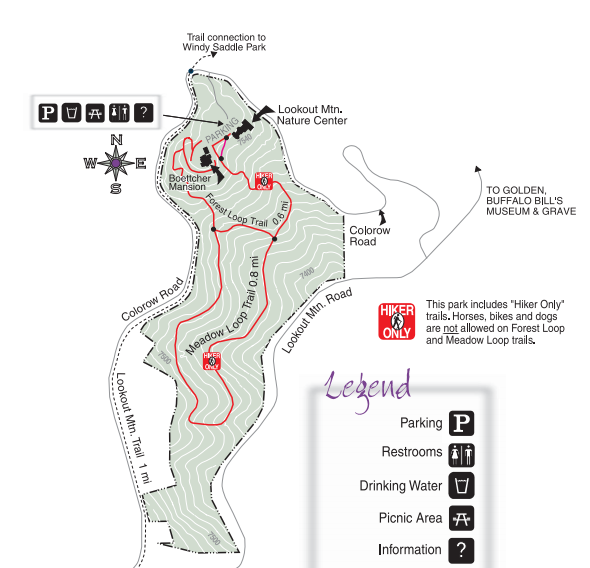 Escape from the crowds and enjoy a challenging adventure via a 12.6-mile, round-trip journey on this trail passing through three adjoining Denver Mountain Parks External Link Icon to the west. The parking area is approximately four miles west of Morrison on the south side of State Highway 74. This mountain-top oasis offers gentle hiking trails past ponderosa pines and through meadows, affording panoramic views of the Denver metro area. Our 134 acres provide habitat for black bears, mountain lions, bobcats, mule deer, elk and Abert’s squirrels, which are often captured on our wildlife camera. Wildflowers abound in warmer months, while peace prevails on snowy winter days. The 1.4 miles of trails are open to hikers, snowshoers and cross country skiers, but are closed to bicyclists, equestrians and those hiking with a dog. Adjacent Windy Saddle Park allows all of these uses. Lookout Mountain Nature Center promotes conservation of Jefferson County's open spaces through educational programs and exhibits. The Preserve is open daily from 8:00 am to dusk. 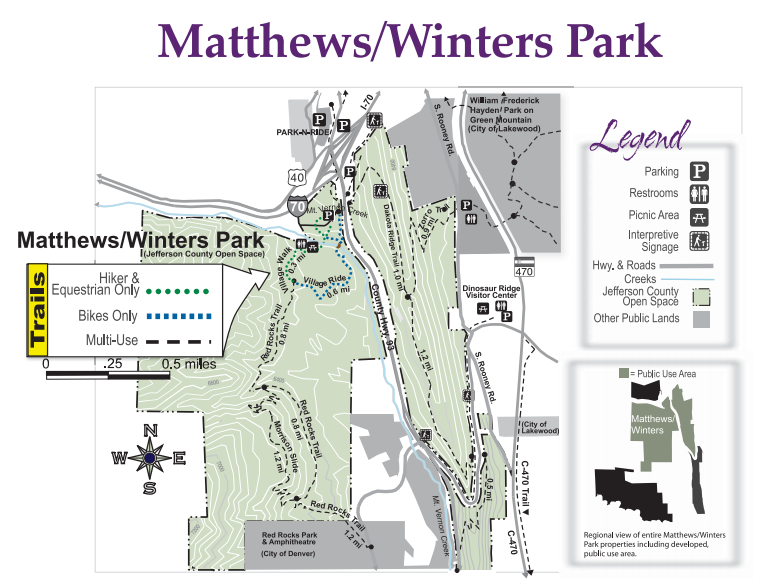 A creek that winds past wild plum and willow trees greets visitors to Matthews/Winters Park, offering a bucolic setting for picnickers and a starting point for reaching the City of Denver’s Red Rocks Park by trail. Across State Highway 93, the Hogback offers a different recreation experience, with a steep climb up to the hulking ridge between plains and foothills. Dinosaur Ridge Visitor Center is a neighboring attraction, providing interpretation for the dinosaur tracks imprinted on the eastern face of the Hogback. The property was also home to the Town of Mount Vernon, a gateway to mining regions to the west and briefly the capital of the Jefferson Territory. The town disappeared as Colorado’s political and economic hub shifted to Denver in the 1870s and 1880s. From I-70 or U.S. Highway 40, go south on State Highway 93 approximately 0.1 mile and turn at the park entrance on the west side of the road. An alternative is the Stegosaurus Park-n-Ride Lot on the east side of the road, south of I-70, allowing access to the Dakota Ridge Trail. There are three different hike options to reach the falls: a one mile hike, a three mile loop, and a 3.9 mile hike –all taking you to Maxwell falls. 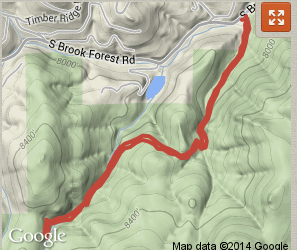 The Lower Trail is a 3.9 mile loop trail rated as moderate. The Cliff Trail Loop as a longer hike. From the upper lot in, keep left when the trail forks and follow the signs. Enjoy the views before heading downward toward the stream and ultimately the falls. South of Evergreen on Highway 73, take Brook Forest Road for three miles.# To access the upper trailhead, continue to Black Mountain Road, turn left and drive another one and a quarter mile.